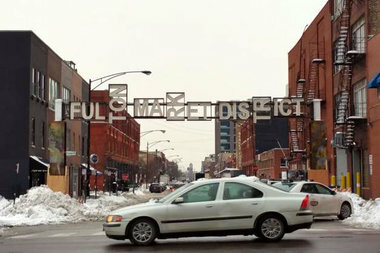 The new Fulton Market District gateway has been installed on West Fulton Street near North Green Street in the West Loop. 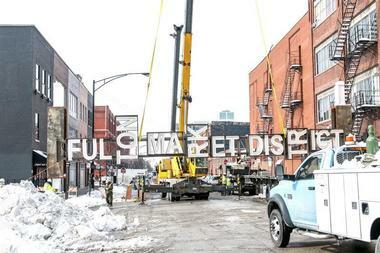 WEST LOOP — The $500,000 gateway marking the entrance of the booming Fulton Market District was installed this week. The decorative gateway, at Fulton Street near Halsted Street, was installed with tax increment financing funds from the Kinzie Industrial Corridor. In August, the Randolph/Fulton Market Association called on the city to halt the project, saying that the TIF funds instead should be used to address infrastructure needs in the area. The gateway is the first project to be completed as part of Mayor Rahm Emanuel's Fulton Market Innovation District, a $42 million development plan to help shape development in the West Loop. The plan, announced in early 2014, would also spend millions of dollars on infrastructure improvements including sidewalk and road repairs. Most of those dollars, including money to build a gateway, would come from the Kinzie Industrial Corridor tax increment financing district set up in 1998. As of 2013, the TIF district had a balance of about $70 million. On Tuesday, Roger Romanelli, executive director of the Randolph/Fulton Market Association, voiced his opposition to the gateway. The money would have been better spent on new traffic signals at Fulton and Halsted streets or Morgan and Lake streets to prevent accidents, a new CTA station at Damen and Lake and street-widening projects, he said. The decorative gateway does not address safety or transportation issues, and won't boost economic development in the area, he said. "Despite these and other urgent projects requested, the Emanuel Administration chose the Fulton Street decorative gateway as the most important TIF project. In the process, City Hall declined to gain community support for the gateway including the design which is criticized by many as inappropriate," he said.